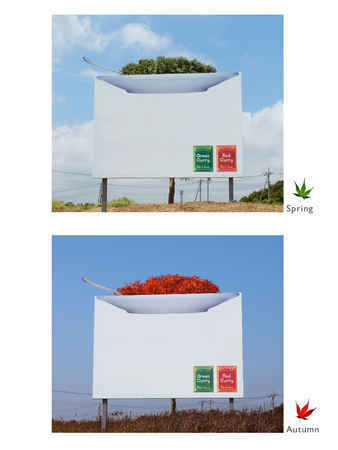 "To accompany the launch of two new products, Red and Green curry, we found an unusual way to cut through. At a prominent spot next to a busy road, we erected an outdoor board immediately in front of a tree. The tree was in full leaf and was pruned to look as if the leaves were the curry on the plate in front. The optical illusion worked and stayed in place until autumn when the leaves turned to red." TBWA\G1\TOKYO & Hakuhodo for House Foods Japan. 2005 Silver WorldMedal at New York Festival.